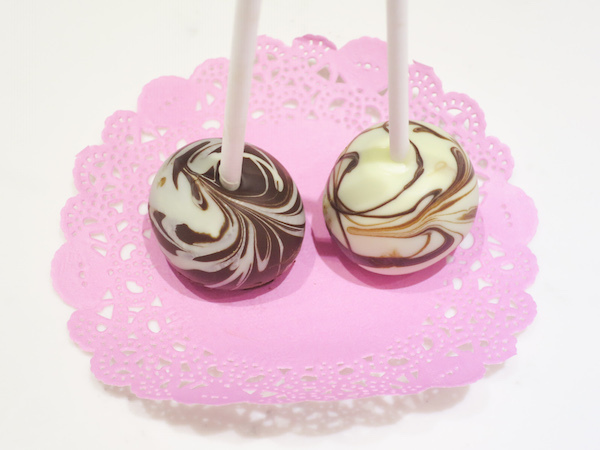 Chocolate marble on cake pops is a very simple yet elegant design. I’ve been doing these since my first cake pops a few years ago (they are my husband’s favourite), but only recently I realised you can make two of these beauties at once! The chocolate needs to be hot and runny for smooth coating. You may need to reheat the chocolate in the process – I used deep ramekins to dip them in and popped the ramekins in microwave on defrost mode for 10-20 seconds when the chocolate started to dry. White chocolate overheats easily and should always be heated in shorter intervals. 315 grams chocolate cake crumbs recipe for a simple cocoa cake at the end. Prepare Nutella frosting by placing butter, milk, Nutella and half of the powdered sugar in a mixing bowl and start mixing on medium speed until smooth. Gradually add remaining powdered sugar while continue mixing on high speed. Mix the cake crumbs with Nutella frosting by using a spatula and continue mixing by hand until the mixture is smooth and even. Take small portions 18-20g and shape into cake balls. Cover with plastic wrap and place in refrigerator while preparing for coating. 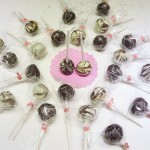 Melt the dark chocolate in double boiler or microwave and place in a cup or ramekin deep enough to cover the cake ball. Repeat for the white chocolate. Take the chilled cake balls from the refrigerator. 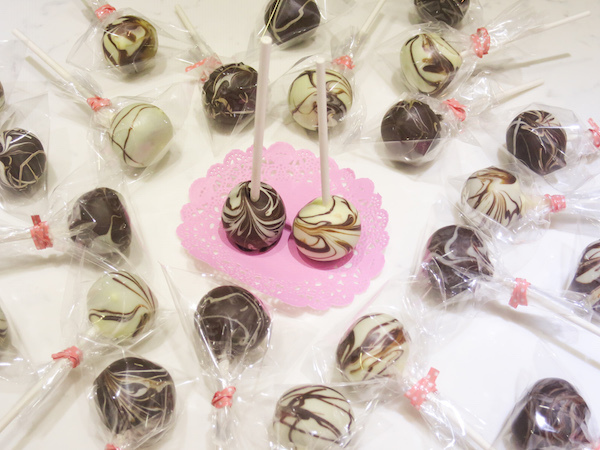 Take two lollipop sticks and dip the ends, one in dark chocolate and other one in white chocolate and insert in cake balls gently pushing up to middle so that you feel it sits firmly. Allow the base to dry before dipping. Carefully dip into melted chocolate one in dark chocolate and one in white chocolate. Lift them up and rotate on top of each other over a deep plate allowing to drip over each other while swirling the sticks in your fingers. Gently tap to remove excess and swirl around holding them upside down. Put in a cake pop holder and allow to dry. Serve right away or wrap individually in treat bags. Depending on the temperature either store in room temperature or in the refrigerator. Simple cocoa cake I used in this recipe does not require a mixer. You just combine dry ingredients, then add the wet ingredients adding the hot water last. Mix until incorporated and bake in a lightly greased cake tin at 180°C for 30-35 minutes. Crumble when cooled.